Didn’t I say I was going to take Sunday off? Well, I woke up and didn’t feel bad. I actually felt quite good. Looking out the window it appeared to be a great day to run as it was totally foggy. Saturday night I had looked over the Trails Challenge trail list to see what trail I would make number five. The first I looked at was a run from Ardenwood Historic Farms in Fremont over to Coyote Hills Regional Park. After mapping the route on BuckeyeOutdoors I found that the route was really 8.3 miles as opposed to the 6.4 miles. As far as I could tell, the route on the list didn’t take you all the way back to the start. Most of the route also is on pavement and I prefer to run on trails when I can as it is not as harsh on my old joints and I like getting away from suburbia. These two parks, however, are really nice. Ardenwood is a pretty authentic historic farm and often has activities going on. If you’ve never been there I would highly recommend it. Coyote Hills Regional Park I remember most as being the place, about 20 years ago, where I would go to fly RC gliders. It has a lot of paths and, I think, a good place for a family bike ride, though, some of the trails are on rolling hillsides. In looking at the list some more I found a 4.2 mile trail route in the Brushy Peak Regional Preserve that would fit the bill. 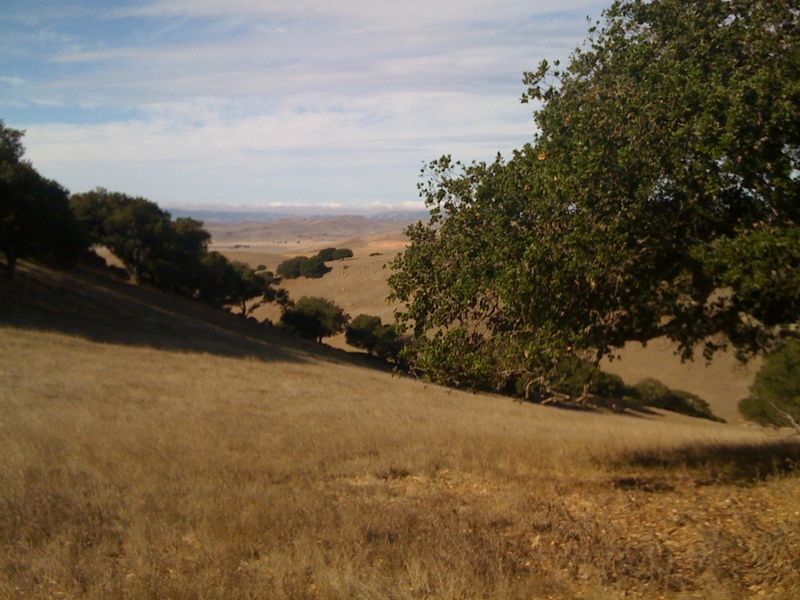 The trail, which heads up to just below Brushy Peak in Livermore, was listed as Moderate. Sounds like that’s probably accurate. I’ve flown over this peak a lot as it is a landmark when contacting Livermore Tower for landing clearance if you are heading in from the East. It’s also a fantastic landmark when heading back from the Sierra Foothills, or other areas of the Central Valley, as you can see it from well over 65 miles out. Rarely do I need to use the aircraft’s navigation aids when I’m flying back from places like Columbia or Calaveras because I can make out the distinct shape of Brushy Peak. According to the park map, the peak is only 1,702 feet ASL but it really stands out and makes it easy to get back to Livermore airport. According to my Garmin Edge 305, the staging area where the trail starts is about 600 feet ASL. The top of the route reaches just about 1,400 feet ASL, about 300 feet below the peak. The Garmin had the total ascent for the route at 1,000 feet. The climbing wasn’t too bad since I’m used to always running hills but what truly killed me was heading back down after cresting between Brushy Peak and the lower peak to the south. It looked like it would just keep gradually descending but, come to find out, with about a mile left the route had you take a sharp right turn onto another trail that had me climbing VERY steeply 200 feet up in .2 miles. It was all I could do not to stop but I just pushed through it, knowing I would soon be back to the start. The Brushy Peak trail, like that at Roberts Regional Recreation Area, was very well marked and I had no problem following the instructions. The view of the Livermore Valley from near the top of the trail was truly spectacular. I also enjoyed hearing the windmills grinding away as I passed down the hill below them. In the saddle between the two peaks are a lot of sandstone formations and oak trees. It’s noted in the Trail Challenge guide that what looks like brush on the top of the peak, and hence the naming of the hill, is actually oak trees. I can confirm this. It truly lovely and I will definitely need to revisit the park with my family and a camera. Finishing the Brushy Peak trail got me to the required five trails on the list of 20, so, I filled out the Trail Log and sent off for my 75th anniversary completion pin. I look forward to getting it and just wished I had completed the challenge last year. Remember, if I can knock out all five trails in three days then anyone should be able to do this in the many months that the Challenge runs. For those who love the out of doors and haven’t taken advantage of the wonderful resources that our public agencies have to offer, you really need to check out the many East Bay Regional Park District facilities. They are, without a doubt, some of the best parks I’ve ever visited and are well maintained and very accessible. In its two-county jurisdiction, the Park District operates 65 parks, covering over 98,000 acres with more than 1,150 miles of trails. That’s more than I was even aware of. I’d also suggest pushing further from home and checking out the parks that you might not think to visit because they aren’t in one of your local communities. Some, like Black Diamond Mines, also have wonderful tours and a lot of history. Some also are closed to the general public and only accessible via tours, like the Vasco Caves Regional Preserve, a tour I would highly recommend. So, get out there and enjoy the East Bay Regional Park District parks. If you start now you probably could complete the 2009 Trail Challenge by the end of November. Even if you can’t, it is definitely worth a try just to become familiar with all that is available.